Wayne State junior forward Sam Poyton was named College Hockey America (CHA) Offensive Player of the Week after a nine point weekend at Northeastern. 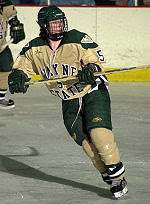 Poyton led Wayne State with nine points (four goals and five assists) helping the Warriors to a series sweep of Northeastern. In game one, Poyton scored her second career hat trick (including the game winner) with two assists for a team and game high five points in WSU’s 6-2 victory. In the Warriors’ 7-2 game two win, Poyton continued her impressive offensive output with four points, scoring the game-winning goal with a team-high three assists. She also finished with a plus/minus rating of +7 for the two games. Poyton (10-11--21) is tied for third nationally with 21 points in just 9 games. Teammates Melissa Boal (15-10--25) and Lindsay DiPietro (5-17--22) ranked 1-2 nationally in scoring. The Warriors (6-4-0) will take on the Rensselaer Engineers in pair of games at the Coliseum in Detroit this Friday and Saturday.